Main aim of semi-automatic dish washer machine isto reduce human efforts and time with its innovative simple design which is also environment friendly. A dishwasher is a low cost machine made up of easily and readily available parts in daily life. The model of semi-automatic dish washer machine is new concept, which in its one washing cycle does all the operations of conventional dish washing i.e. spraying soda water, scrubbing with brush and rinsing with clean water similar to fully automatic dish washer machines in market. The dishwasher operates with help of DC motor, Universal motor, conveyor belt and microcontroller for time delay. Dish which is placed on the conveyor belt enters the first washing chamber where it is cleaned with soda water and scrubbed with the brushes. This is then passed to next chamber where it is rinsed with the clean water and finally moves out as a complete washed dish. 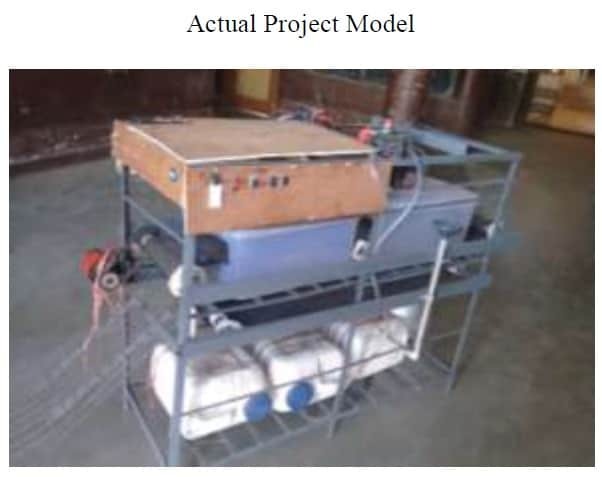 solution of above problems with semi-automatic dish washing machine with objectives that it should minimise human efforts and should have low cost with less time consumption and must have all the basic mechanisms – washing with soda water, scrubbing with brush and rinsing in clean water.